Tarpon Bend of Coral Gables Taps Intermedia Touch to Invest in Innovative Signage to Attract and Entertain their Guests. Tarpon Bend, an upscale raw bar and grill located in the heart of Coral Gables’ Miracle Mile is set on giving their customers a premier experience. That said, the popular eatery and nightlife destination is putting its money where its mouth is! Having teamed up with the multimedia gurus at Intermedia Touch, Tarpon Bend has created an interactive, state-of-the-art dining and hospitality endeavor. This initiative has been created as part of a strategy to attract and entertain guests by with a new, innovative approach. 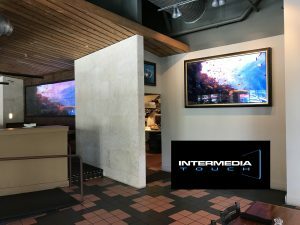 Intermedia Touch has created a simple strategy to increase sales by providing a memorable way to enjoy the dining experience using unique and engaging technology. Intermedia Touch, creators of industry-leading digital signage and custom interactive solutions worked their expertise with the installation of a jaw-dropping array of multimedia video displays throughout this beautiful Coral Gables establishment. Comprised of 8) 55″ displays to entertain their guests in the main dining room, 2) 55″ LED displays on the outdoor patio which greet guests entering the restaurant, and a huge 85″ inch display mounted near the bar, Tarpon Bend has been transformed from a casual eatery into a dynamic destination combining digital intuitiveness with a welcoming hospitality all its own. “The dynamic of our clientele is incredibly diverse and given the passion we have towards creating a lively and entertaining experience for everyone who comes to Tarpon Bend, we feel the best way to embrace this is by evolving with the times and, in turn, with what our guests expect of us.” said Mr. Wayne Cameron Eldred, Owner of Tarpon Bend. The addition of digital signage and multimedia solutions within the restaurant space has rapidly become the new standard as owners realize the advantages of visually engaging technology. As guests enjoy a drink at the bar or seated at the patio areas, taking in the surroundings of Tarpon Bend’s invitingly modern, yet thoroughly Floridian decor, management has the ability to share daily promotions, showcase special PPV events, or even use these interactive displays as electronic menu boards. This enables a simple way to provide casually-enhanced engagement between patrons and the restaurant’s many offerings, all without overstepping the customer experience with their marketing/ advertising initiatives. Since its inception in 2002, Intermedia Touch, Inc. has become a leader in interactive technology and custom application solutions for a broad range of clients who wish to advance their business initiatives. 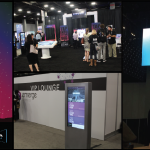 Combining extensive experience and unmatched service as a technology integrator, their goal is to create unique experiences by making use of the latest interactive technology and applications available in the digital signage industry. Intermedia Touch, Inc. offers powerful software solutions, as well as a diverse array of interactive hardware options including interactive touch screen monitors, infrared surfaces, video walls, holographic glass, indoor/outdoor kiosks, and custom LED signs. With more than 15 years of experience in the information technology and audiovisual fields, the team at Intermedia Touch, Inc. delivers interactive solutions which create the highest visual impact and relevance specific to your target audience. Tarpon Bend is the quintessential upscale dining experience located in beautiful Coral Gables, Florida. Featuring a modern interior with polished concrete floors, comfortable booths, original artwork with tables and fixtures made from salvaged Dade County pine. The feeling inside Tarpon is reminiscent of the Florida Keys with an open-air feel throughout the dining room and adjacent café seating area along the sidewalk. This layout concept offers guests a front-row view of the sights and sounds of Miracle Mile. Tarpon Bend features day-boat fresh fish specials and top-quality choice meats from local sources. Everything on the menu, from entrees to salads and appetizers to desserts is freshly prepared in- house daily. For more information on the products and services that Intermedia Touch, Inc. has to offer, feel free to contact their Miami office at 305-517-3894, or send an email to info@intermediatouch.com. You can also visit them online at www.intermediatouch.com or in person at 2600 NW 75 Avenue, Suite 200, Miami, FL 33122.